I have two layers; one is the foreground and the other a background. 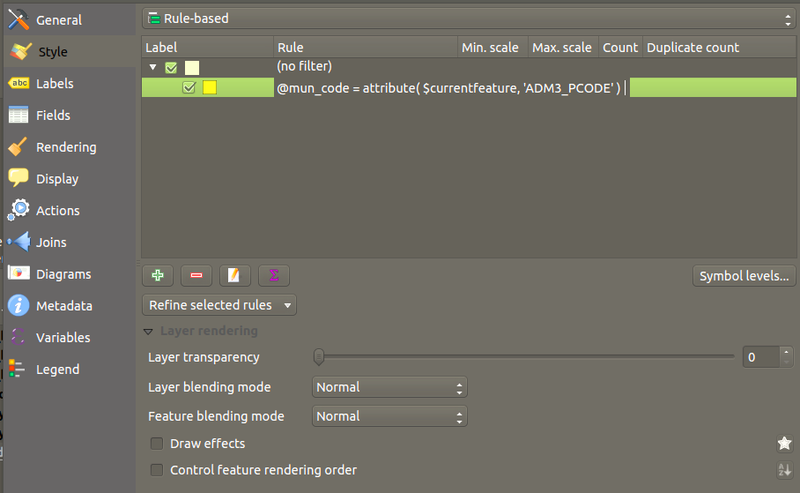 Both layers have fields containing similar values (field values in the foreground layer (mun_code) is also present in the background layer's fields (ADM3_PCODE). For instance, both fields may contain the value 012802000). I already Generated an atlas choosing the foreground layer as the Coverage layer. My understanding is that $currentfeature (in the code above) is already automatically controlled by the Print Composer Atlas, so I am wondering why it returns NULL. @ is for QGIS integrated reserved variables ... i think u meant "mun_code" (keeping the double quotes) to reference the attribute value ... But your aim remains unclear to me : Did u build any relation between the two tables ? Relation based on attributes (has any join been setup ?) or based on geography ? If u want to test the content of an attribute located in another table you have to define a clear relation. Not the answer you're looking for? Browse other questions tagged qgis print-composer expression atlas rule-based or ask your own question. Filtering features in other layers of QGIS Atlas? Rotating map canvas for QGIS 2.8.3 atlas generator? On QGIS Composer how to filter the atlas coverage layer using a project variable (rather than just a value)? Filtering elements of layer with active element of QGIS atlas with geometry functions? How to display an attribute value from a related layer in Atlas?